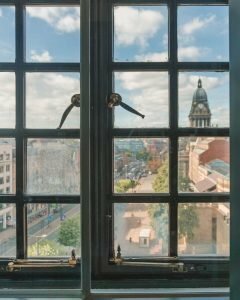 Before I went to Leeds, I was asked what I knew about the city already and what my expectations were. I’m pretty sure the Yorkshire Evening Post didn’t want to hear “it’s somewhere in Yorkshire and they talk funny?” but that was pretty much my main knowledge of the city. Yes, Leeds is in Yorkshire (specifically the West Riding of Yorkshire) and still to my southern ears they speak pretty darn differently (as stereotypes go, us southerners are known for taking the mick out of those from the north) but now I am already planning a return to photograph more of the most instagrammable places in Leeds! 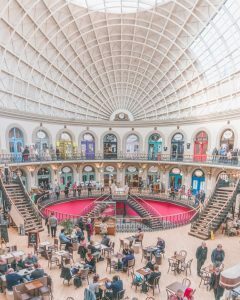 While best known for its role in the Industrial Revolution, Leeds has much more than industrial buildings to show for itself – from craft coffee to amazing cocktails and from spectacular architecture to amazing market halls, Leeds really does have something for everyone. 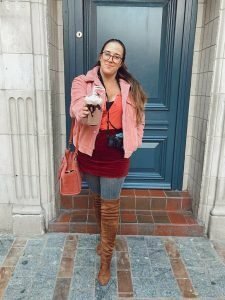 I have rounded up my top recommendations for instagrammable spots in Leeds, including bars, restaurants and shopping malls! While the city of Leeds has a very industrial past, it also has some incredible Victorian architecture as well. 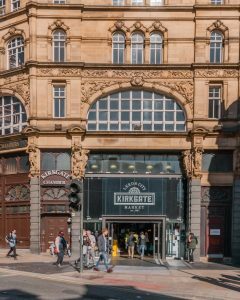 The construction of one of the shopping arcades was referred to in one local newspaper as “a necessary antidote to the severely plain buildings of industrial Leeds”, and since then many beautiful examples of Victorian architecture were erected in the city. 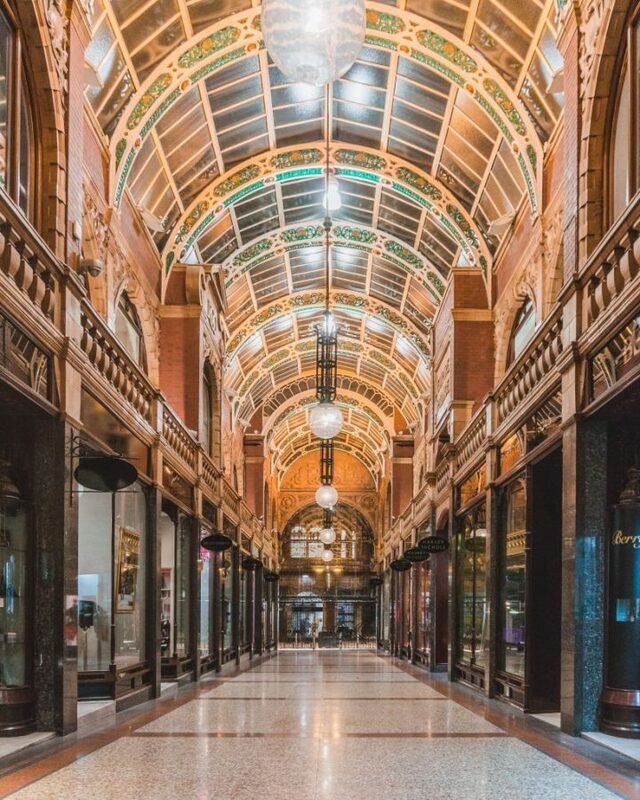 Victoria Quarter – consisting of Victoria Gate (the new part opened in 2016), Queen Victoria Street, Cross Arcade and County Arcade – is one of my favourite parts of the city. For me, County Arcade is one of the prettiest shopping centres I’ve ever seen! It was constructed in 1897 and, along with Cross Arcade, is the largest and most elaborate arcade in the city. A shopping arcade (rather than a shopping centre or shopping mall) is different as it isn’t an entirely enclosed space, but rather pedestrian walkways that just happened to be covered, and in the case of County Arcade, this covering is a glass roof supported by cast iron arches. 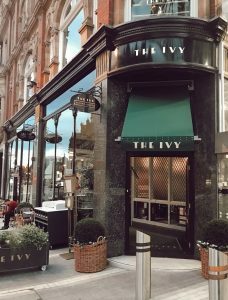 Located in the Victoria Quarter, the newly opened The Ivy is a perfect spot to enjoy a delicious cocktail, yummy brunch or a lovely dinner. 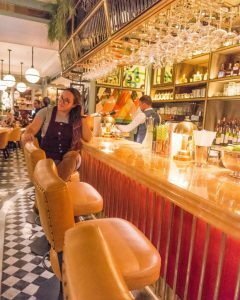 The decor is just as wonderful as the other restaurants from the brand – it’s stylish, modern and thoroughly instagrammable! While the modern architecture might not be to everyone’s tastes, no one can deny that Victoria Gate is an architectural marvel in both design and construction. The building is wrapped in a grid of diamonds that evoke the structures that you probably learned about in high school chemistry, those known as Buckminsterfullerene (also known simply as C60), and, according to the architectural practice that designed and constructed it, was inspired by Leeds’ history as a textile manufacturing city. Either way, it does look pretty impressive! 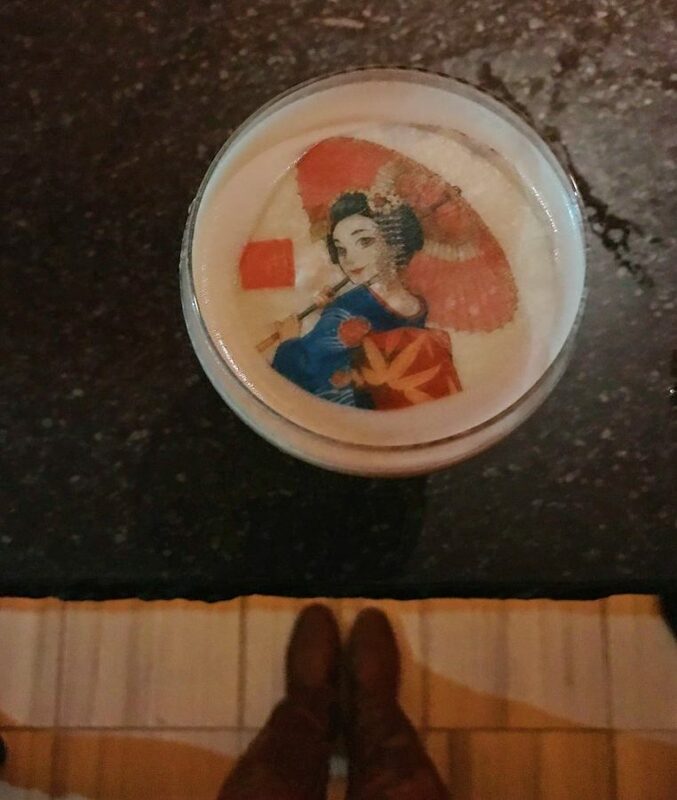 Also located within Victoria Gate is the Japanese restaurant and rooftop bar, Issho. 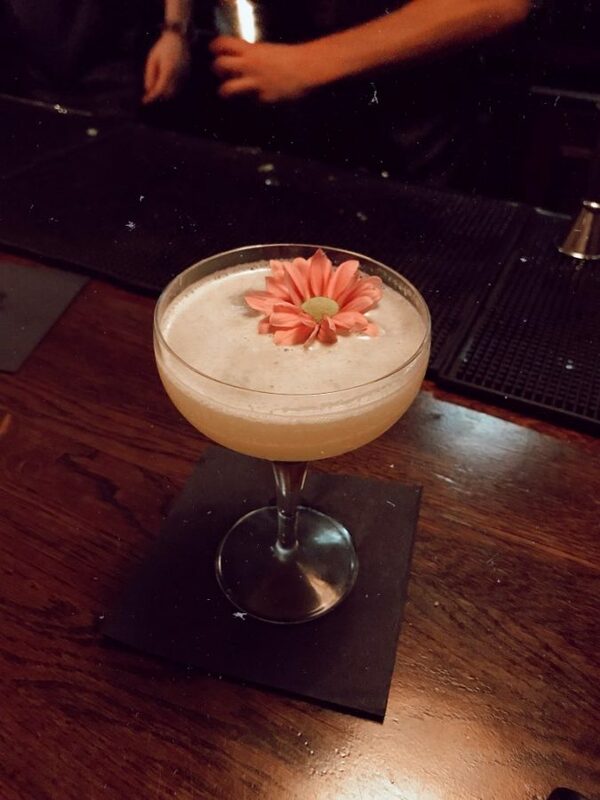 The bar offers Japanese inspired cocktails, including the amazing Geisha cocktail that we got to try! The restaurant caters well to those with dietary requirements and they were amazing in letting me know which dishes were lactose-free and which were not – they also have standalone vegan, halal and gluten-free menus so there’s something for everyone to enjoy. I highly recommend the duck bao buns personally, they were definitely my top choice from the night! Leeds Town Hall is situated directly opposite the Radisson Blu, where we were staying. I had an amazing view from my window of the distinctive clock tower, which was added after civic leaders told the architect that they wanted the town hall to be even grander. It’s home to many concerts and events and can even be hired out for private events (such as weddings)! Just around the corner from Kirkgate Market (find out more about that in the section below!) is the magnificent Corn Exchange. This Victorian building was completed in 1864 and was designed as a centre for trading (of corn, not surprisingly) and is one of only three corn exchanges in the country that still operates as a centre of trade. 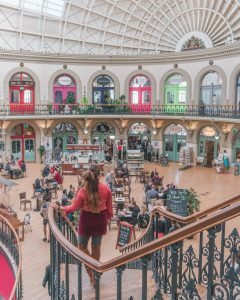 Instead of corn, however, the Corn Exchange is now full of stylish yet quaint independent shops, such as a wonderfully named hummus and pita bar (Humpit), a vintage camera shop and a beerhouse, as well as many, many more. 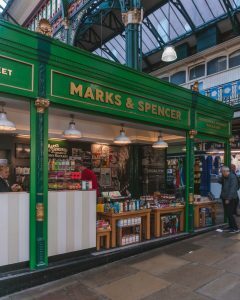 Leeds is home to the impressive Leeds Kirkgate Market, which is the largest covered market in Europe and also was the birthplace of Marks & Spencer (which is still there today!). 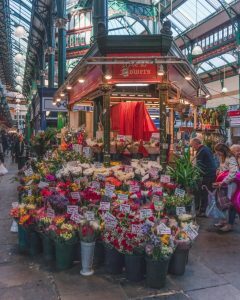 The markets opened in 1822 and now is home to 800+ stalls, including a new street food market where you can try a variety of foods from delicious seafood to amazing Indian fare and the well-known Yorkshire Wrap. I recommend a stop by Manjit’s Kitchen for yummy vegetarian and vegan Indian dishes (their potato curry dish is amazing) and excellent craft beers from local companies – it’s run by the lovely Manjit and her husband Michael who are currently crowdfunding to open a new location for evening trade (since the market closes at 5pm), which will support other local businesses and charities. 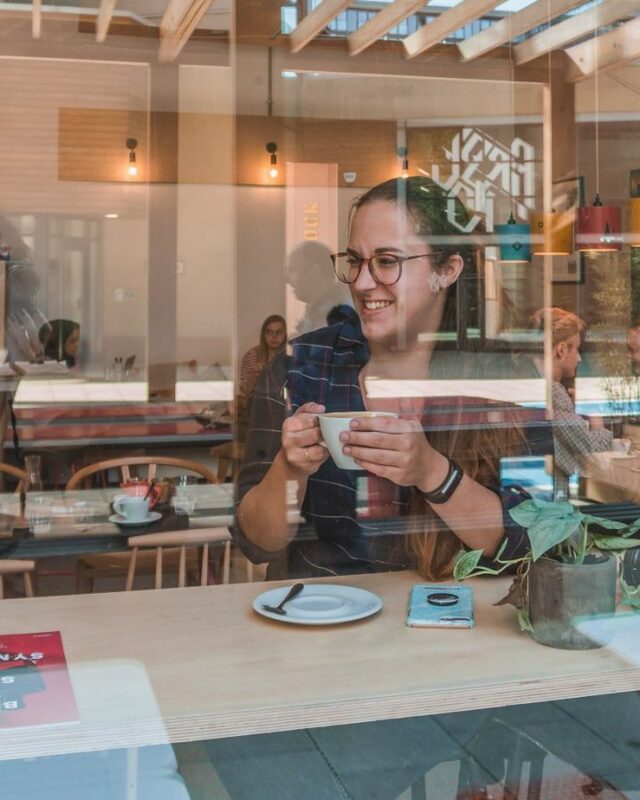 After you’ve had your fill of delicious Indian fare, head over to The Crêpe Hut, a tiny café near the Vicar Lane entrance serving crêpes (shockingly), waffles, milkshakes and hot drinks. They also offer delicious vegan milkshakes, as well as vegan crêpes and waffles as well. If I give you this milkshake, will someone else deal with this for me? Travelling to Leeds from London? 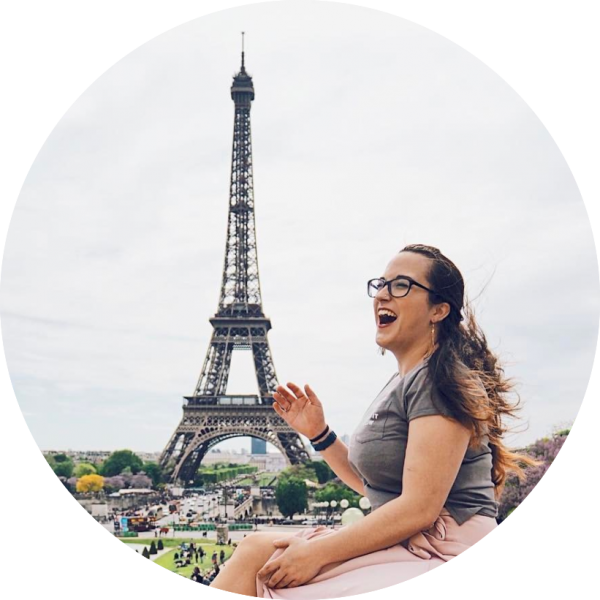 Check out my guide to the most instagrammable places in London! I was originally going to include these in different subsections, but the Leeds food scene needs a section of its own! 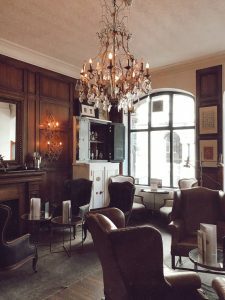 In addition to the aforementioned The Ivy and Issho, there are a whole host of amazing spots around the city producing delicious food and drinks while also being stunningly instagrammable. 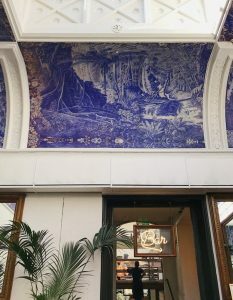 Ibérica is the place to go for tapas in Leeds and the interior of this Spanish restaurant is incredible. I highly recommend trying the chorizo lollipops (they may sound odd but these are thick chorizo slices in tempura batter and served with an incredible pear aioli – they are amazing!) and the patatas bravas. 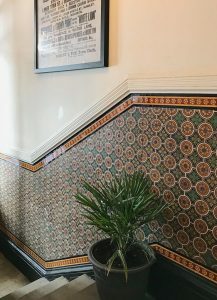 Located in a former textile mill, Headrow House is home to Redondo Beach and roof terrace, as well as the ground floor Beer Hall and Ox Club restaurant. Enjoy a delicious cocktail on the roof terrace or try the amazing brunch at Ox Club on weekends – it’s all instagrammable here! Located at Leeds Dock, North Star Coffee roasts their own coffee and is the retailer to many of the local coffee shops. Try a ‘split shot’, where you get a tray with one single shot latte (with regular, almond or oat milk) and one single shot espresso. 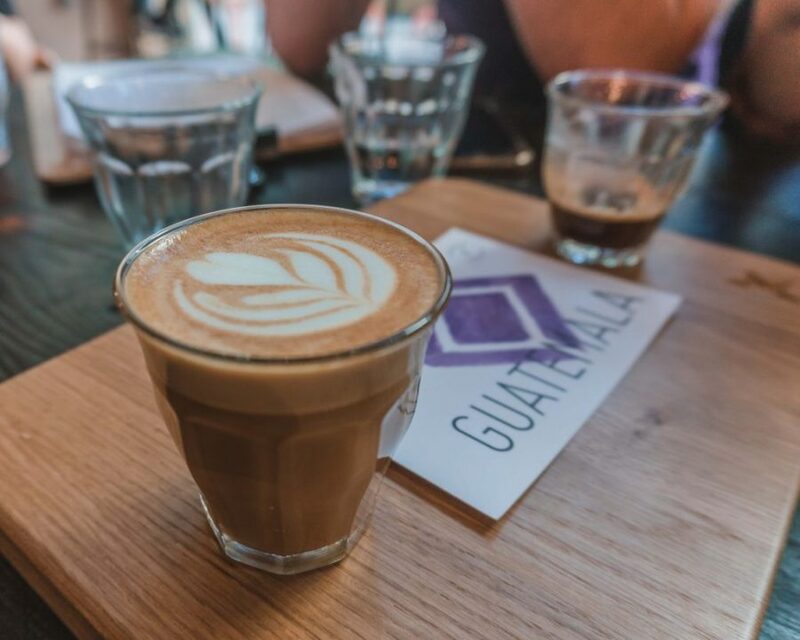 It’s great for tasting the difference between the coffees (you can try a variety, such as El Salvador, Guatemala and Kenya coffees) as well as the difference that adding milk to espresso makes. 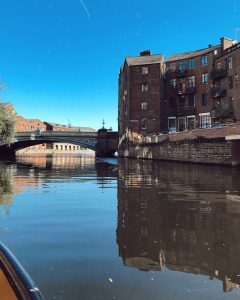 Travel to North Star from the main station by water taxi from Granary Wharf for a mini-tour of Leeds by water! 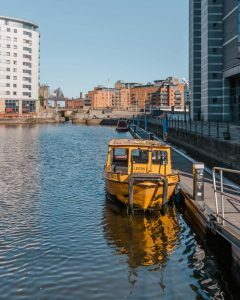 For a great way of seeing Leeds, take a water taxi from Granary Wharf to Leeds Dock. 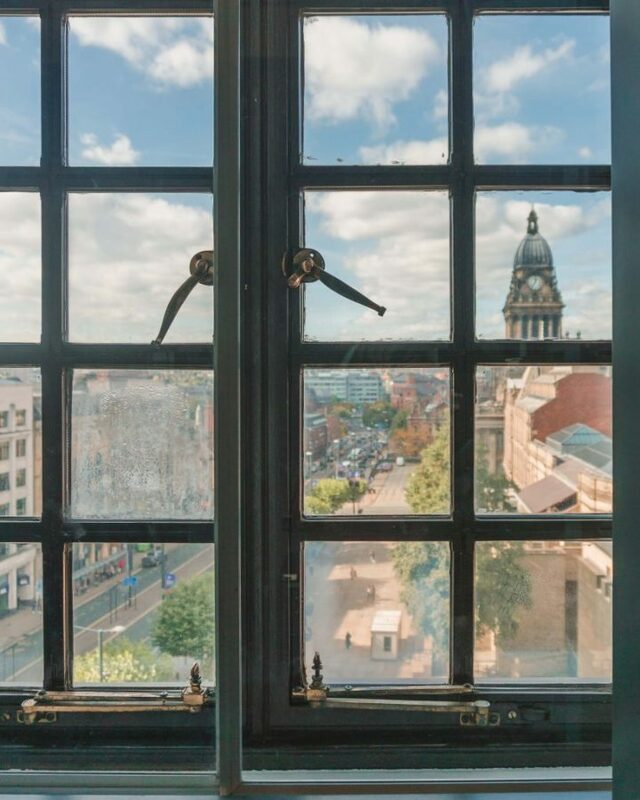 It’s a great way to see the city and also to get to places like North Star Coffee Roasters, Leeds Minster or the Royal Armouries. Plus – even better – it’s totally free! The two boats are called Twee and Drie and run every 20 minutes between Granary Wharf (by the south entrance of Leeds train station) and Leeds Dock. Sounding like something out of Game of Thrones, the Dark Arches will be on your route to the water taxi. Located under Leeds train station, these historic arches are home to the underground waterway carrying the River Aire, the main river running through Leeds. 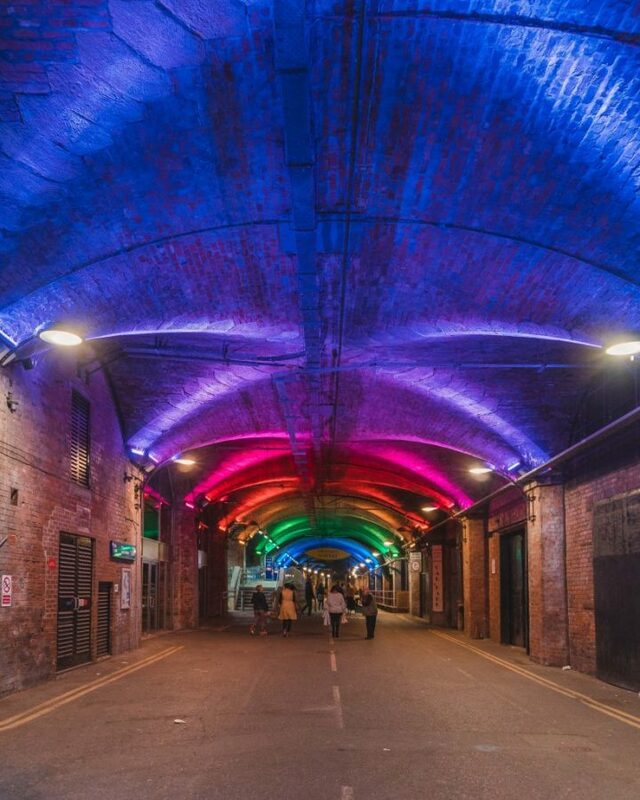 This underground area is home to bars and shops, as well as an amazing light installation. It’s a great grungy photoshoot spot in Leeds! We were privileged to be invited to stay at the wonderful Radisson Blu Leeds for our stay. 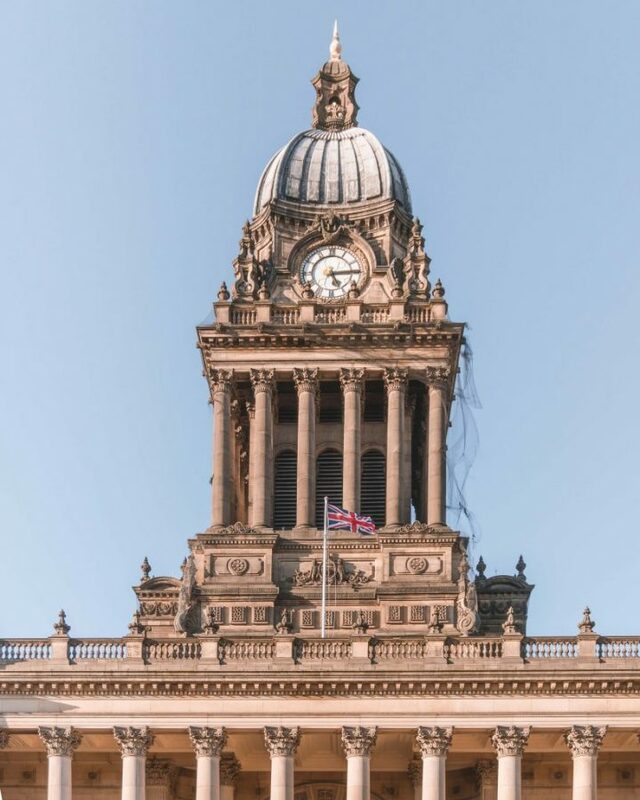 The Radisson is located right on The Headrow in central Leeds, only steps from the Town Hall and City Art Museum and less than a 10-minute walk from the main station. There is also an onsite bar and grill restaurant which offers a great 2 for £10 cocktail deal from 5-7pm – compared to the usual cost of cocktails in the UK this is a bargain! Leeds is blessed with excellent transport links. I travelled from the south coast by train – I opted for a quicker journey via London Waterloo where I then changed trains to the LNER London – Leeds service. There is a slightly longer option with Cross Country that is direct if you don’t want the hassle of changing trains! 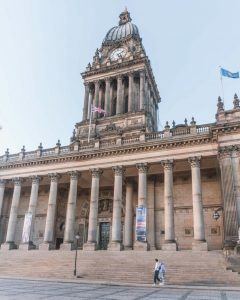 Leeds is well connected by train to many cities across the UK, including direct trains from Glasgow, Edinburgh, Birmingham, London and Manchester to name a few. National Express also serves Leeds with coaches from multiple UK cities, with direct coaches from cities including Bristol, Edinburgh, Cardiff, Leicester, Plymouth, Oxford and Liverpool. For travelling from further afield, Leeds Bradford Airport serves the city of Leeds and flies direct to 75 destinations including Prague, Paris, Berlin, Budapest, Dublin, Rome, Riga, Vilnius, Amsterdam, Faro, Warsaw and Barcelona as well as multiple UK airports, including London Heathrow, Jersey, Guernsey, Newquay and Southampton. 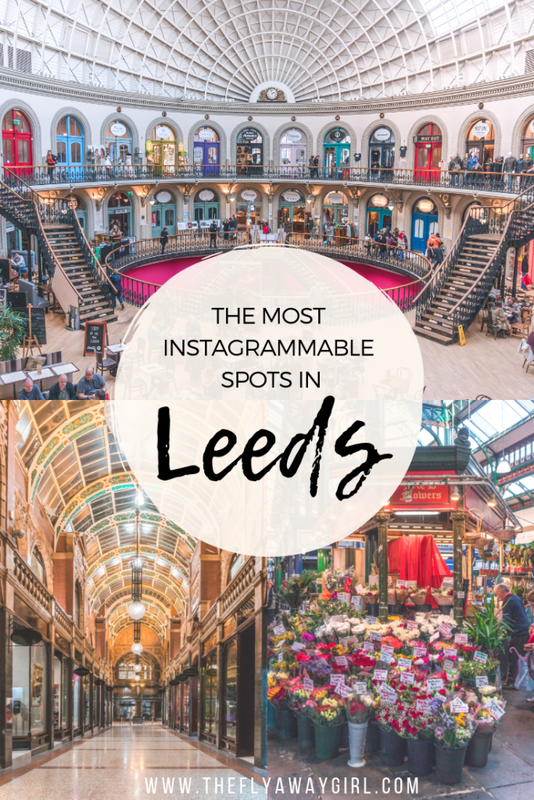 After Leeds was voted one of the top cities to visit in the UK and you’ve read all about the most instagrammable places in the city… how could you not want to plan a visit?! 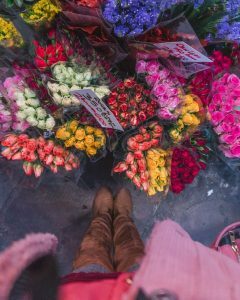 I’m already planning a return visit (after all, they have an amazing Christmas market) – let me know in the comments if I’ve convinced you that Leeds is a city you can’t miss! Interested in seeing more of the UK? 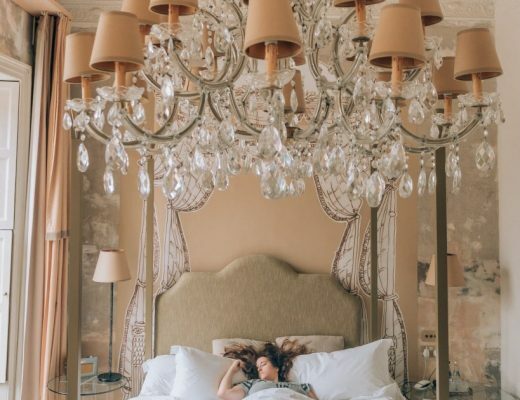 Check out my guides on the best villages in the Cotswolds and unusual things to do in Bath. 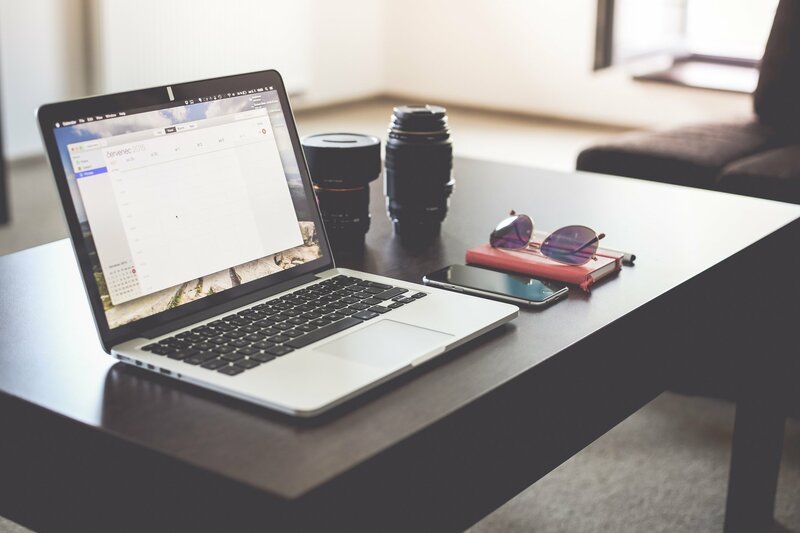 Don’t forget to pin this post if you enjoyed reading!